Salviati is a family and a group of companies. They were glass makers and mosaicists who worked and sold their products in the cities of Murano, Venice and London.The firms were Salviati, Jesuram & Co., Venice and Murano Glass and Mosaic Co., Pauly&Co and today Arc International. The founder was Antonio Salviati.One of the most important family members was Giulio Salviati (1843-1898). 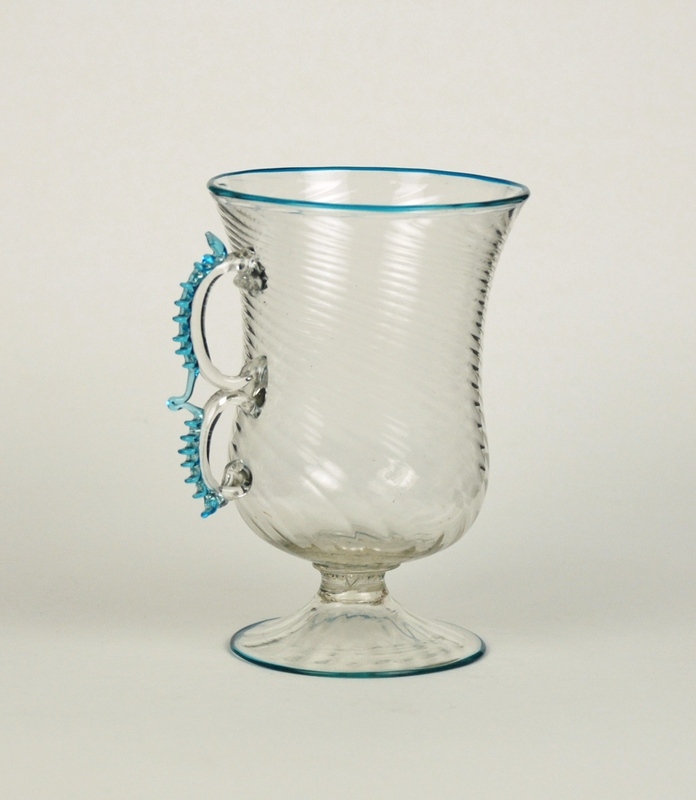 The provenance of the Salviati goblet pictured is the Carder Collection.Fredrick Carder managed the Steuben Glass Works in Corning NY and developed many of their early designs and glass formulas. These two similar vases differ only in their color. They are possibly from the Salviati Co. and probably 19th C. One we acquired in April 1995 and the other April 2009. The body of this cristallo cup is diagonally ribbed and has a handle with a double scroll decorated with turquoise pincering. It also has thin turquoise trails on rim and edge of foot.